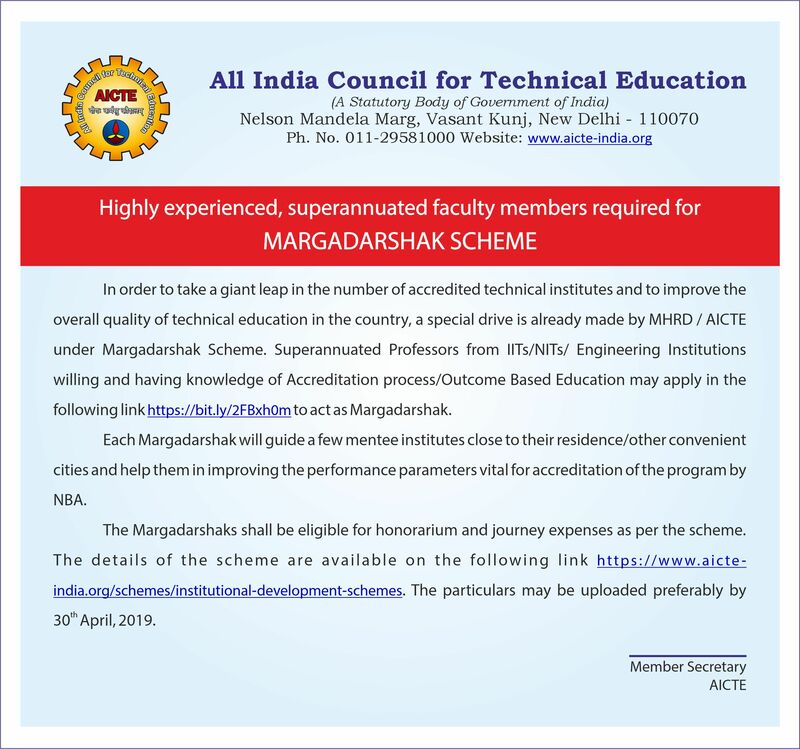 AICTE/MHRD has devised a new scheme called “Margadarshak”. In this scheme Mentors (Margadarshaks) are identified for institutions which are yet to get NBA accreditation. These ‘Margadarshaks’ can be serving or preferably superannuated, willing and motivated teachers having good knowledge of the process of accreditation and can devote adequate time to make required visits to guide these Institutions. These Margadarshaks shall function from prestigious institutes identified as Nodal centers/Mentor Institutes. required quality parameters in the institutes to enable them to apply for NBA accreditation of their programmes. The Margadarshaks would assist in training the teachers, Outcome-Based Education (OBE), improving the pedagogy, focus on technical skill, life skills, Innovation and creating capacity and capacity to solve problems among students, developing better teaching-learning, and assessment including Laboratory or practicals. Co-curricular and extracurricular components also be an integral part of the responsibility of Margadarshaks. In OBE, designing Programme Outcomes (POs) for a programme & Course Outcomes (COs) for each course are desired to be done. The maximum number of visit per Margadarshak per month can be ten. They will be paid an honorarium of Rs. 5,000/visit and travel expenditure as per the provisions of the scheme. For full details, click here and the brochure is available here.